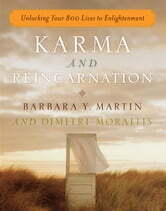 A comprehensive, visionary guide to the karmic cycle and its role within our life-both the life we're living and the lives to come. There is life after death, and Barbara Martin has seen it. Now for the first time comes her inspired, firsthand account of the intricate world of spiritual rebirth. The award-winning authors of Change Your Aura, Change Your Life reveal the afterlife in a work based directly on Martin's personal explorations of the world to come and awe-inspiring clairvoyant experience with the spiritual world. -Provides essential keys to spiritual development. A true spiritual wonder in a single, fully accessible volume, Karma and Reincarnation is perfect for both those taking their first steps down a spiritual path and longtime spiritual students.